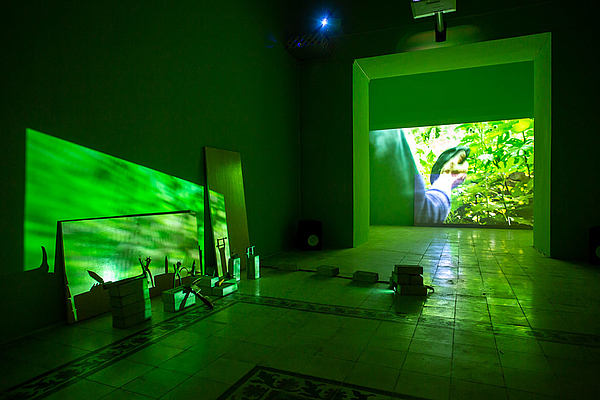 Basel Abbas and Ruanne Abou-Rahme’s video installation confronts the apocalyptic imaginary and violence that dominates our contemporary moment, asking what happens to people / places / things / materials when a living fabric is destroyed. Young Palestinians visit the sites of their destroyed villages inside Israel as an avatar for re-thinking the site of wreckage, which emerges not just a place of ruin and trauma but appears full of an unmediated vitality, resisting colonial erasures. 3 July - 4 October 2018. Second of the three phased exhibitions and events to celebrate 30 years of succesful work to support contemporary art and culture in Jordan.